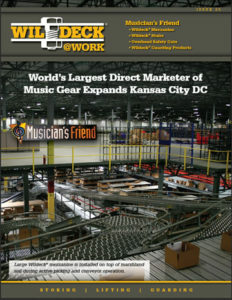 Founded in 1983, Musician’s Friend has grown rapidly to become the world’s largest direct marketer of music gear. Their vision is to give musicians the best prices and selection available, along with superior service to help musicians achieve their goals in music. Musician’s Friend prides itself on having a topflight customer service staff who live and breathe the products they sell. The Wildeck® mezzanine is a recent addition to the facility, along with the hundreds of new product SKUs recently moved into the building. Musician’s Friend had just acquired another company, and needed to find space quickly to handle the new inventory. In their case, they faced two options: expand the building or add a mezzanine. 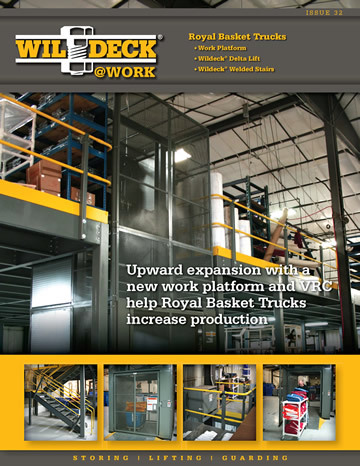 In the tight timeframe the new inventory was due to arrive, the decision was to go with a Wildeck® mezzanine. A new 64,800 sq. 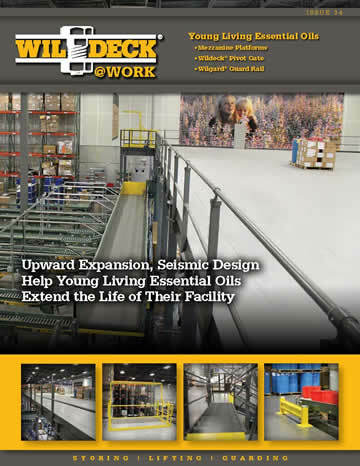 ft. Wildeck® mezzanine now stands in the middle of their 700,000 sq. ft. distribution center in Kansas City, MO to help utilize the vertical space and manage the 36,000 products Musician’s Friend carries. Products offered include guitars, basses, keyboards, percussion, amps, as well as recording, mixing, lighting, and DJ gear. Hundreds of new products are added monthly as the company continues to broaden and deepen its offerings. Wildeck dealer, Storage Solutions, Inc. has a long standing relationship with Musician’s Friend and was called in to help expand storage space in the existing building. “Because we performed well for them in the past, Storage Solutions was chosen for this major project,” explains Vice President of National Accounts, Eric McDonald. 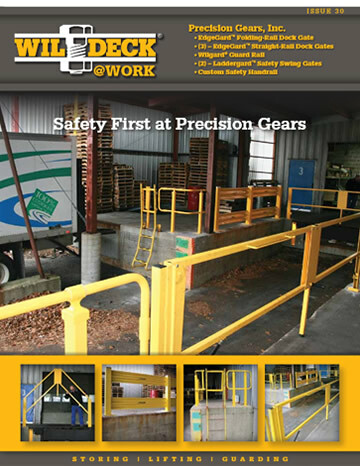 The Wildeck® mezzanine was a practical solution. The 64,800 sq. ft. mezzanine was designed to stand 15 ft. off the ground. 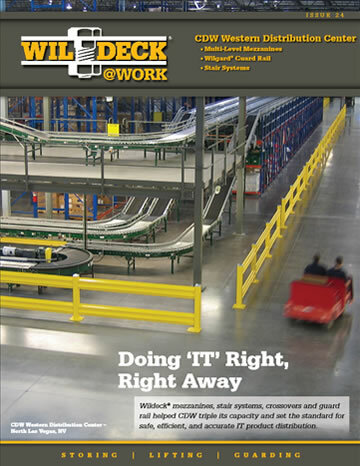 To complete the project on time, Wildeck and Storage Solutions faced a few challenges. The first hurdle to address was the expedited time frame. The mezzanine had to be completely manufactured and installed in less than 8 weeks so that Musician’s Friend would have a place for their newly acquired inventory. Secondly, there could only be minimal interruption to their normal operations. Orders still needed to be filled and picking had to continue in the facility. 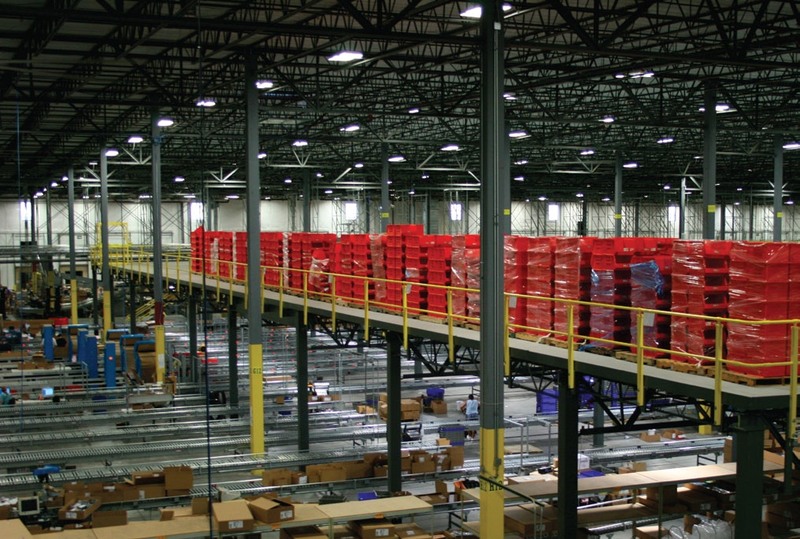 Active conveyor, employee, and fork truck traffic needed to be fully operational while the mezzanine was assembled. The operations had to run 24 hours/ 6 days a week and the mezzanine installation could not interrupt the heaviest picking hours. Installers worked 12 hour shifts during the hours of 6 p.m. – 6 a.m. to avoid the busiest hours of fulfillment. Active picking not only determined what time the installation could take place, but also determined when and where the installers could work to erect the mezzanine. The active picking conveyor could not be altered during the install. This added to the finesse the installers orchestrated to bring in columns and equipment that would handle the assembly of the mezzanine. Third, the existing conveyor lines added to the complexity of the mezzanine column placement. Storage Solutions called in a surveyor to locate and indicate column placement within the available space networked between the active conveyor lines. The surveyor proved to be a huge asset to visualize and place the columns, as there were no clear lines of sight and plenty of equipment to block the view. The mezzanine design had exceptionally wide column spacing which translated into heavy column loads. This fact led to the last and the most difficult obstacle: the soil was unable to support the new mezzanine structure. Musician’s Friend’s facility is located on marsh-quality soil. The subsoil located below the building slab would not provide the mezzanine columns with enough stability; therefore, additional footings were required to provide the necessary support. The calculations the engineers came up with required unbelievably thick footings. “We had to drill two helical piers at each interior mezzanine column, and then one more at the perimeter mezzanine columns,” said McDonald. “Then we had to go in and pour our footings over the top of that.” The stable soil depth ended up at 22 – 24 feet for approximately 150 piers that were needed for this large mezzanine. Typically, column footings are only 3 feet deep! Musician’s Friend’s success is due to many factors, but the one that really stands out is their unique and knowledgeable staff. “Musician’s Friend has a number of talented musicians working here, and they can ‘talk the talk,’ so to speak,” said Jim. “And our customers like that.” With excellent service, and a newfound opportunity to utilize existing facility space, Musician’s Friend is on the fast track to extraordinary growth.